Off-piste skiing in the Dolomites is our specialty! We combine unique local knowledge and expert guides for an unbeatable skiing experience – exploring some of the most pristine backcountry you can imagine. Book today! Discover Lift-Service Off-Piste Skiing in the Dolomites! If you are looking for the ideal off-piste skiing experience, look no farther than the Dolomite Mountains. There are countless miles of off-piste terrain in the Dolomites, just waiting for you to find fresh tracks… as if 1,200 kilometers (746 miles) of prepared on-piste slopes at the 12 Dolomiti Superski resorts weren’t enough! On a Dolomite Mountains off-piste skiing adventure, you’ll leverage the lifts at the resorts as much as possible, and boot pack or don climbing skins for places the lifts can’t reach, so you can explore some of the most pristine off-piste terrain you can imagine. Deep powder skiing and face shots – now that’s the stuff our winter dreams are made of! There’s a lot of terrain to navigate here – but on a Dolomite Mountains off-piste adventure, you’ll ski with a UIAGM/IFMGA Mountain Ski Guide each day who will guide you to the best off-piste terrain and snow conditions to match your interests and abilities. While the emphasis is on where, rather than how, you ski, on our off-piste ski trips you’ll also have general coaching from our expert guides, and tips and hints on how to ski specific terrain and snow conditions. And, like our on-piste ski safaris, you’ll experience the welcoming atmosphere of hotels and rifugios – alpine inns set high atop the mountains, where you can savor the excellent culture and cuisine unique to the region. Please contact us for more information on booking your off-piste skiing holiday in the Dolomites. 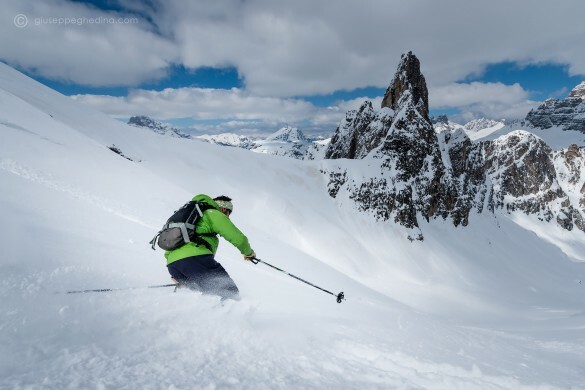 Freeride the Dolomites and challenge yourself on incredible off-piste terrain and couloirs! Leveraging resort lifts, you’ll don climbing skins for places the lifts can’t reach, and explore some of the most pristine backcountry you can imagine!